My whole being knows when something is wrong. Sometimes I know exactly what it is, and other times I can’t quite put my finger on it. I can be conscious or unconscious of what is bothering me. And the more I get to know myself, I see that I have a choice to make about whether I notice if something is bothering me. Our work for improvement, at the scale of self, city or planet, requires an awareness first of what bothers me/us. We need to notice the itch before we’ll scratch it with the express purpose of thinking, making and doing new things. Many posts ago I described the work of Don Beck and Christopher Cowan on Spiral Dynamics (here’s a link to my first post on their work, evolving value systems). Here’s a simple pattern they offer about phases of change and how the itch feels (see pages 85-92 of their book). Beck and Cowan highlight five phases of change, each easily recognizable moments in life. At Alpha (top left of illustration), everything feels good and comfortable. At Beta, we begin to sense that something is wrong. At Gamma, we know something is wrong and feel quite confused about what to do and could be very angry. Through all the discomfort of Gamma, we can emerge at Delta with a new sense of direction and enthusiasm that can lead to New Alpha – a new sense of stability. The amount of time we spend in each of these phases of change varies – a moment or decades. 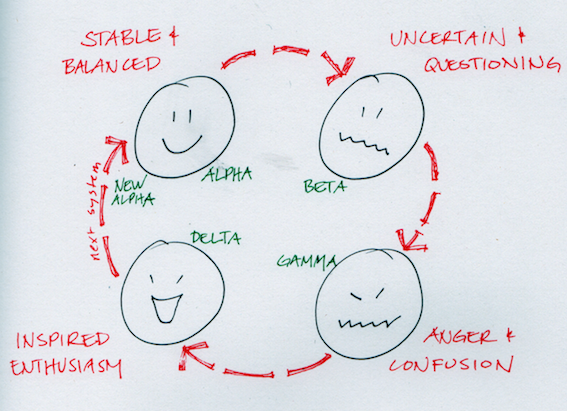 As things change around us, we may remain at Alpha, not yet noticing the uneasiness of Beta. If open to learning, when we find unsettling conditions at Beta and Gamma, we will find ways to understand the discomfort and know it precisely. If really angry and confused, we could be at Gamma for a long time. If not well equipped to see how to formulate plans and implement New Alpha, we could be at Delta for a great length of time, or even revert back to Gamma. Here’s the clincher – if we welcome and seek deeper knowing, we invite uneasiness. As we look for new ways to think, make and do things – the which is the source of the city impulse articulated in Chapter 1 – we aim to improve our lives, and by doing so we are creating new life conditions to which we will again have to adapt. Time, immediately or longer term, will reveal new uneasiness with those life conditions for nothing is as simple as making everyone happy all the time forever. This means that as we work to organize ourselves, in cities or anywhere, we must develop practices to recognize when we are feeling uneasy at Beta and practices to figure out what is making us uneasy. We need to develop practices that will help us through Gamma. We must develop practices that allow the Delta prototypes to thrive on their way to New Alpha. Behind the scenes here, there are a series of other questions around the practices that we each need, individually, for self. And how we practice as groups, communities, neighbourhoods, organizations, cities and for the human species. We are on a learning journey together as we think, make and do new things to improve our quality of life. I will explore practices that support our learning journey specifically in Part 3 of Nest City. My next post will connect our learning journey with Chapter 1 – The City Impulse.